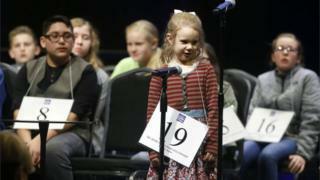 A five-year-old Oklahoma girl has made history by becoming the youngest person ever to qualify for the Scripps National Spelling Bee. Edith Fuller correctly spelled "jnana" to beat more than 50 contestants in the Scripps Green Country Regional Spelling Bee in Tulsa. She also cracked the words Panglossian, Baedeker, nisei and Croesus. The young spelling master will head to Washington in May to compete with other children across the country. Can you spell better than a five-year-old? Jnana is a Sanskrit word for "knowledge" in Indian philosophy and religion. Panglossian describes someone who is excessively optimistic, regardless of circumstances. Baedeker is a guidebook, originating from the series of travel guidebooks by German publisher Karl Baedeker. Nisei is an American or Canadian whose parents were immigrants from Japan. Croesus is a very wealthy person. Croesus was the last king of Lydia (c560 - 546 BC) famed for his wealth. Sarsaparilla is a tropical American climbing plant, or a sweet drink flavoured with the root of this plant. The National Spelling Bee is open to contestants who have not finished the eighth grade. There is no minimum age to compete. "I feel thankful," she said after winning the regional competition on Saturday. Edith, who is home-schooled, faced off against competitors from primary and middle schools throughout northeast Oklahoma. "It's fun to share her with everyone," said Annie Fuller, her mother. "I knew she'd be a novelty, so I'm proud she held her own." Annie Fuller told the Tulsa World the family realised their daughter's potential last summer while quizzing her spelling skills. Edith correctly spelled "restaurant" without having been taught the word. "We knew there was something special there," Annie Fuller said. Akash Vukoti, six, was last year's youngest contestant at the National Spelling Bee. He was eliminated after misspelling the word "bacteriolytic" in the early rounds of the contest.